The Strange Birth and Long Life of Unix « Adafruit Industries – Makers, hackers, artists, designers and engineers! These guys were fighting for the users before it was cool, and you gotta love the use of a suburban dead drop to distribute an operating system. +1 espionage Ken Thompson! Read the whole thing — you’ll be glad you did! 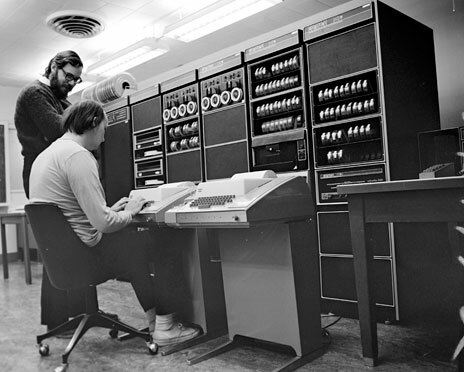 Long live January 1, 1970 when computing for the rest of us started to break away from the mainframe. "With heavy hearts, the researchers returned to using their old batch system. At such an inauspicious moment, with management dead set against the idea, it surely would have seemed foolhardy to continue designing [multi-taksing] computer operating systems. But that’s exactly what Thompson, Ritchie, and many of their Bell Labs colleagues did." Would this be possible these days with Programmer labor costs being accrued by bean-counters at the key-stroke level and Marketing MBA-types hovering over your tiny cubicle saying over-and-over, "Why isn’t it done yet!?" And today we must mention the teams of corrupt Patent Lawyers that make you do everything over-and-over again (resulting in lousy code) to avoid law suits. I wonder if it is like this today in China?